Pingtung Night Market (屏東夜市 / 屏東民族夜市). 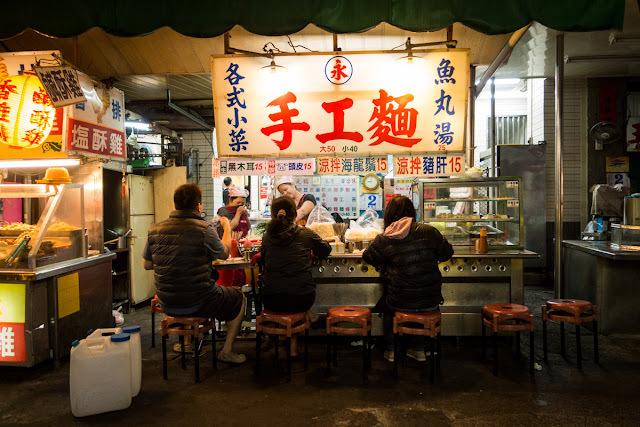 After a great time in Hualien, our next destination was Pingtung, which is not a place that you'd typically find on the itinerary of foreign tourists to Taiwan, but for some reason or other - I'll explain it in a moment - I included it in our route. The train ride from Hualien to Pingtung had some pretty picturesque moments. Here's a photo I took during the trip! 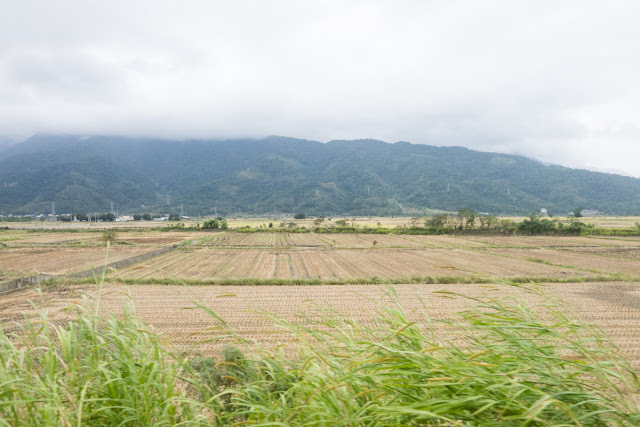 A shot of the scenery from Hualien to Pingtung, taken from the train window. So I think my original idea was to make Pingtung city a jumping-off point for a side trip to the Purple Butterfly Valley in the Maolin National Scenic Area, and we actually arrived at just the right season to see the glorious migration of those purple butterflies, too - but we ran short on time and energy, so we decided to just take it easy in Pingtung. 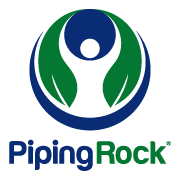 With our original plans shelved, what was there to do instead? Well, the cool thing about Taiwan is that there seems to be night markets wherever you go. 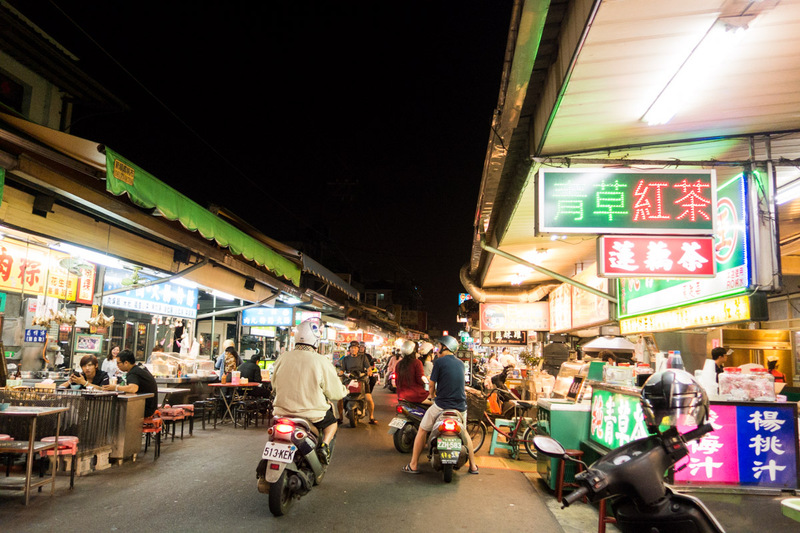 And in fact, the Pingtung market is actually open day and night - that's our food and entertainment sorted! Alright, this was our first stop at the Pingtung night market... Luzhen dumpling shop. We just can't seem to stay away from dumplings in Taiwan. Who can blame us, when they're everywhere and they taste so good? We tried their soup dumplings, which were decent enough. 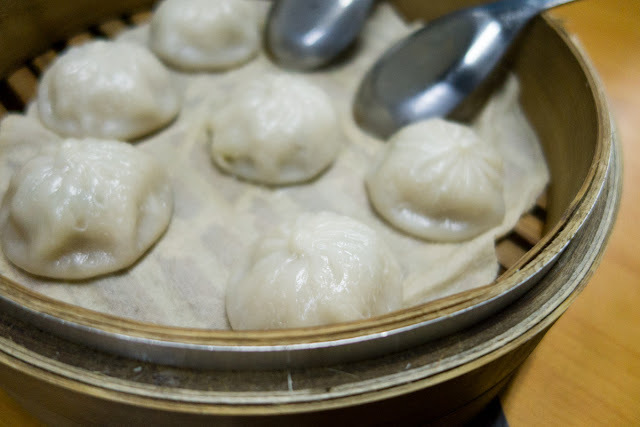 Soup dumplings (湯包), 50 NTD. But it was their pan-fried fennel frond dumplings that really surprised and delighted us. The zingy aromatic fennel fronds made for a fabulous dumpling filling. 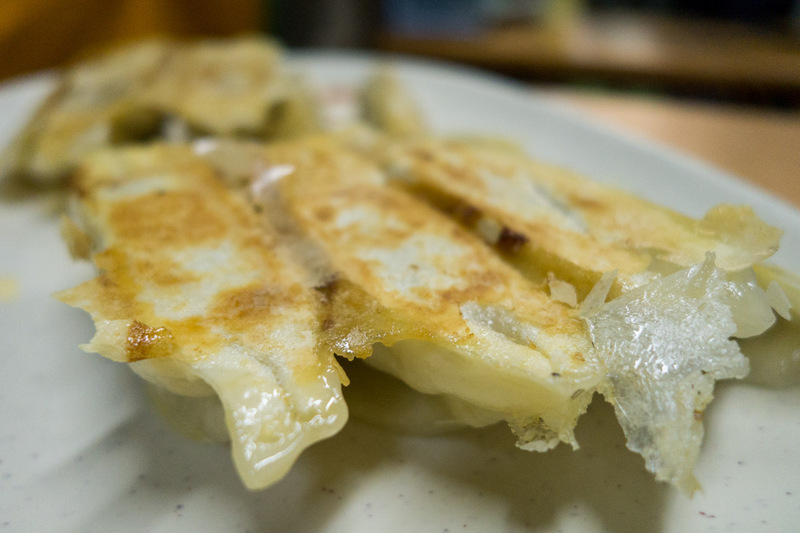 Pan-fried fennel frond dumplings, or fennel frond potstickers (茴香鍋貼), 65 NTD. We also tried the toon or toona pancake with egg, an intriguing snack that features the young leaves from the Chinese toon tree (toona sinensis). The herbaceous garlicky-onion flavour of the toon leaves worked well in this savoury pancake-omelette; it was certainly something new for us! 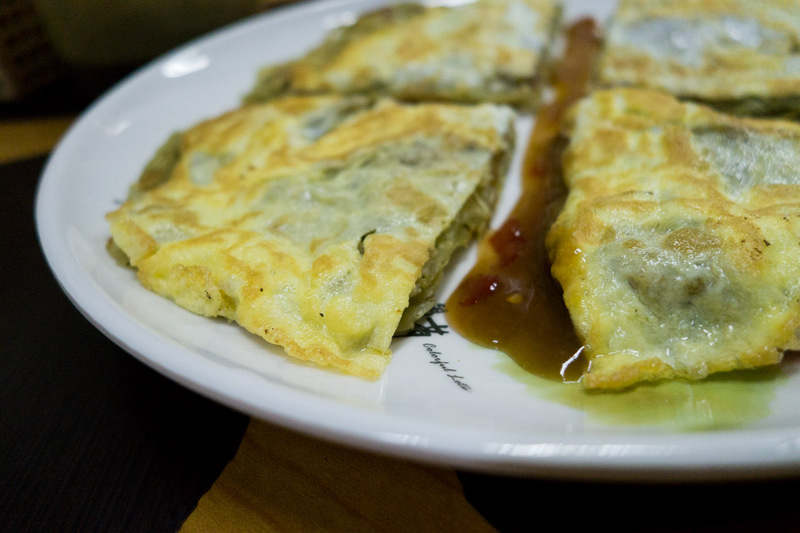 Chinese toon pancake or toon omelette (香椿抓餅), 30 NTD. Add 10 NTD for extra egg. We also stumbled upon this stall selling "geng", a type of soup that is usually thickened with starch. 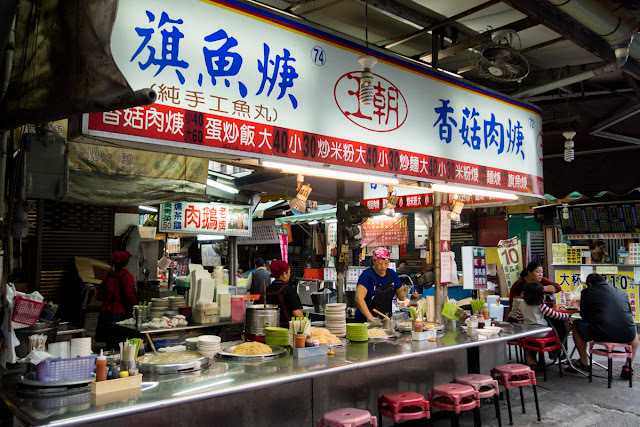 They also sell fried rice and noodles, which you can mix in with your "geng" for a substantial meal. I went for the swordfish fishball soup. My initial concerns about the gluey appearance and texture of the "geng" were washed away upon tucking in - it was surprisingly nice and smooth and went down like a treat. The handmade fishballs were delightfully bouncy, and the drizzle of black vinegar really completed the dish. 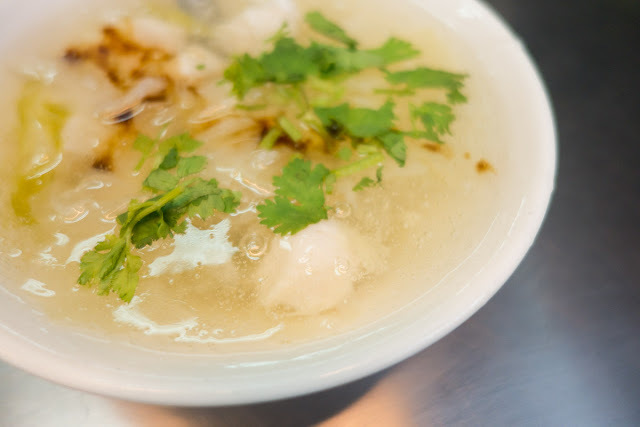 Swordfish fish ball soup (旗魚羹), 40 NTD for a small bowl, 60 NTD for a large bowl. 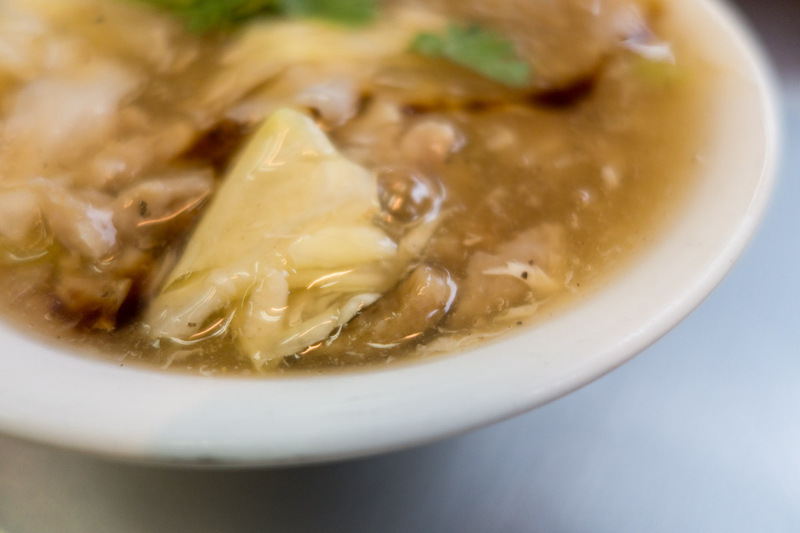 Mushroom and meat soup (香菇肉羹), 40 NTD for small, 60 NTD for large. When I saw this stall, I felt compelled to eat there. The big sign brightly advertises their handmade noodles and fishball soup. 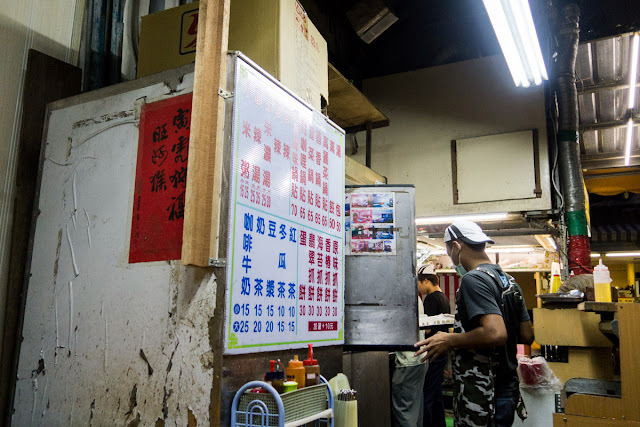 Smaller signs hanging just underneath speak of side dishes such as seaweed salad and pork liver salad. Yong's handmade noodle shop (永記手工麵店). 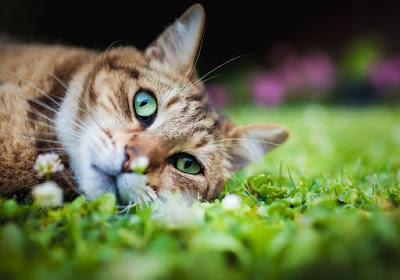 I wanted to share a couple of things here with Simon, but he wasn't interested. So he loitered around while I sat down and ordered a fishball soup for myself. Why, yes, in case you haven't noticed, I have a thing for fishballs, and the ones here were solidly rustic and flavoursome. I do kind of regret not also getting the handmade noodles, as I think that is their signature dish, but hey, a girl can only eat so much. It's all Simon's fault for not being cooperative. 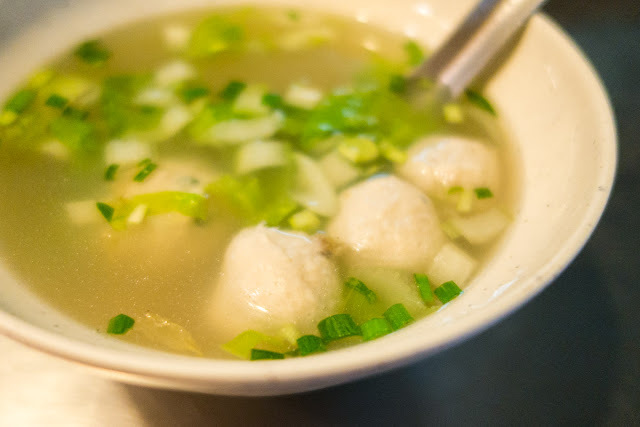 Another fishball soup (魚丸湯), 25 NTD. Ready for something sweet? I thought this shop had a cute name: "Bakery Daddy". 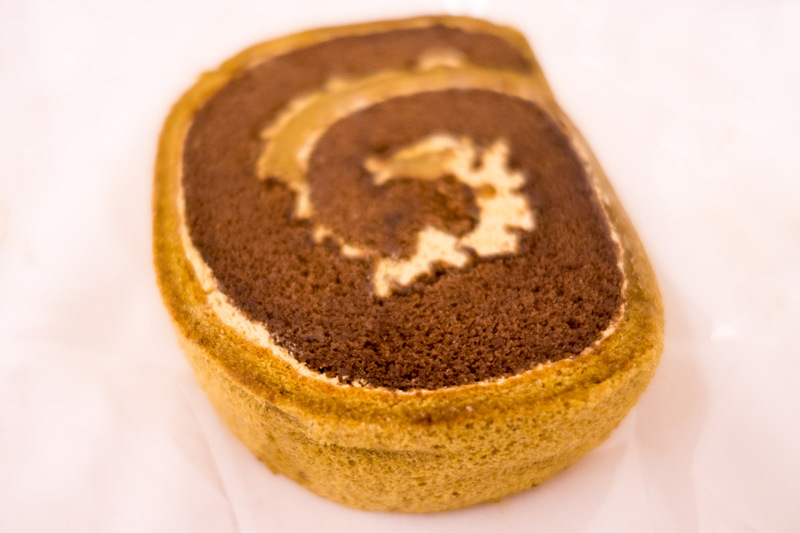 And their Swiss roll is scrumptious! For example, while we were sauntering about, we stopped to admire this temple for a while. 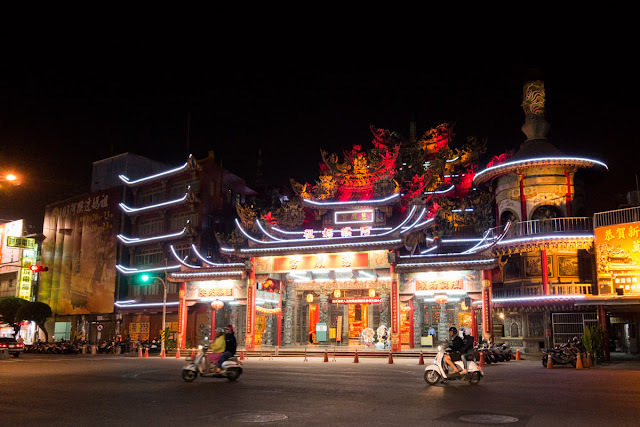 Sea Goddess Temple / Cifeng Temple (慈鳳宮). 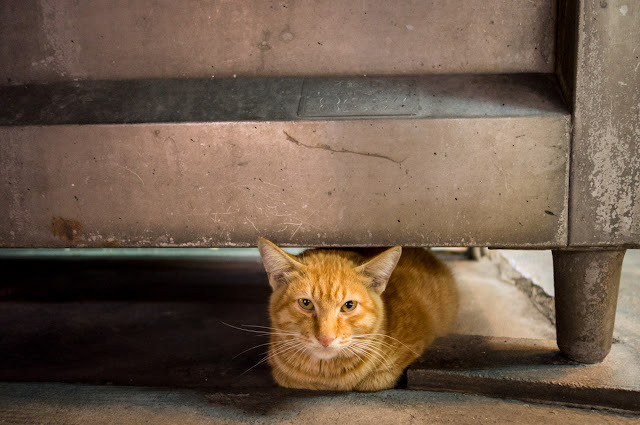 And as always, cats kept us amused. But I think our favourite moment was our discovery of this very old-school video games arcade. It was like going back in time - this is the kind of arcade that was around when I was a kid! And best of all, every single person in the picture is a middle-aged man. You're never too old to play at a video games arcade and this is the important lesson we took away here. Decades from now, I hope Simon and I will still be having fun like kids and teenagers! 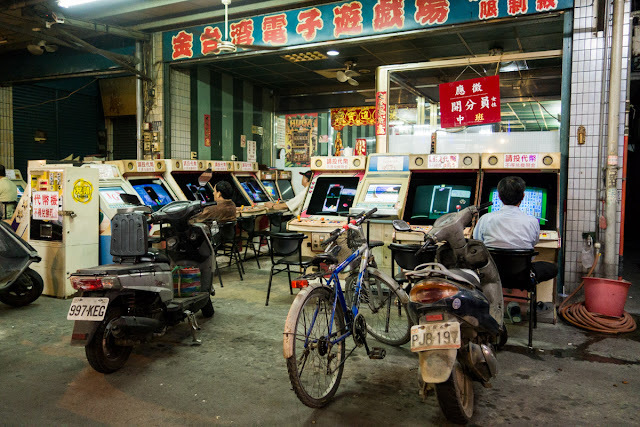 Old-school video game arcade in Pingtung (屏東金台灣電子遊戲場). In summary, Pingtung isn't the typical tourist stop, and there is hardly any English to be seen, heard, or spoken here - I kept telling Simon how lucky he was to have me to act as his personal translator and interpreter. 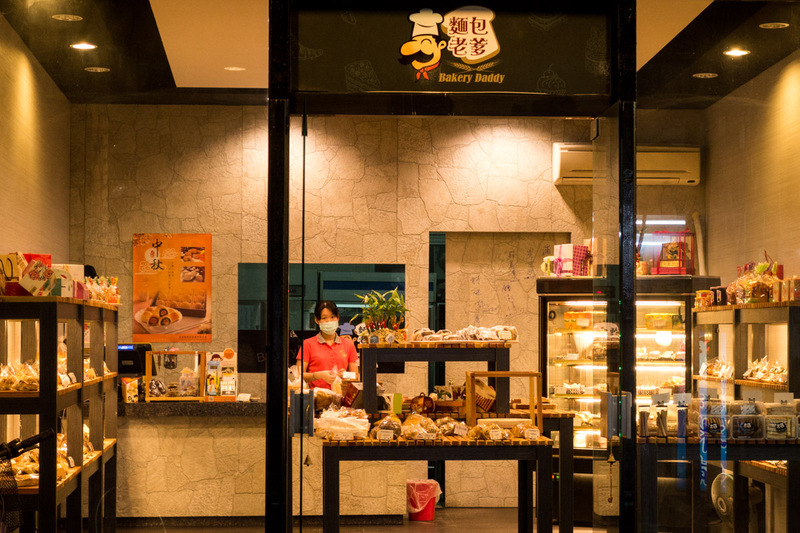 But the food is just as good as anywhere else in Taiwan, so if you do drop by, you'll be well-fed, and you might encounter other pleasing surprises along the way, too.